This week’s #LiftEVERYVoice segment features Ruby Atee Pigford. Ruby Atee Pigford—a black teenager—was raped by a “well-to-do oil dealer” named James Lee Perry. On August 7, 1947, James Perry picked Ruby up after he promised to pay her $0.70 per hour for a babysitting job. However, instead of taking Ruby to his house, James Perry drove to a nearby bar. When Ruby refused to go inside the bar with James Perry, he beat her until she was unconscious. He then raped her, tied her body to the bumper of his car, and dragged her body through town. 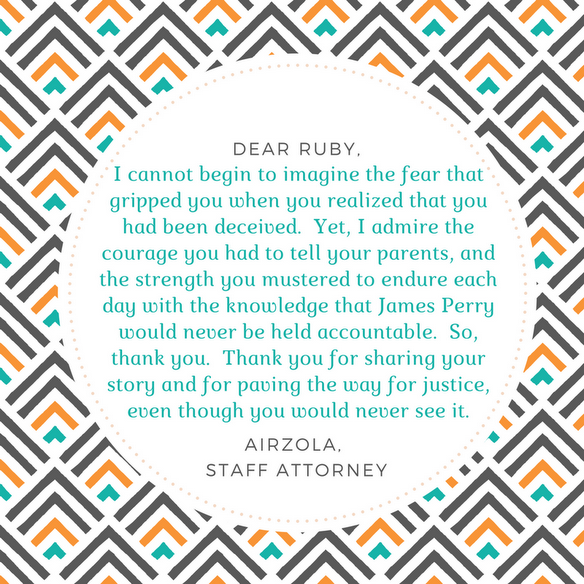 Later that evening, James Perry dumped Ruby’s body outside of her home.